Two of my friends evidently bought into Wrath of Kings a bit ago, but never actually started playing. I'm not sure how it came up in conversation, but I ended up going to their website and checking out the rules. All of the rules, missions and unit cards are freely downloadable, which is a nice change of pace. The Starter Set are normally $70 USD, which is a bit expensive for an impulse purchase/new game. Enter eBay, stage right. I was able to pick up a Starter for $29. If the game is as fun as it looks, it'll be another $50 or so to flesh the army out to a full sized army. 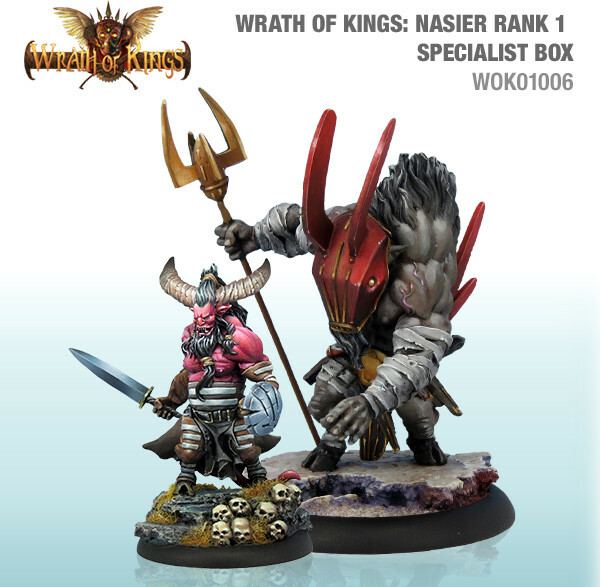 I found the Nasier faction models to be the most appealing. The Starter comes with a Longhorn and a Rathor (the bigger guy). These are the Specialists of the army. These are both Rank 1 models. More on that in a bit. These are kind of like Elites or Solos from other games. 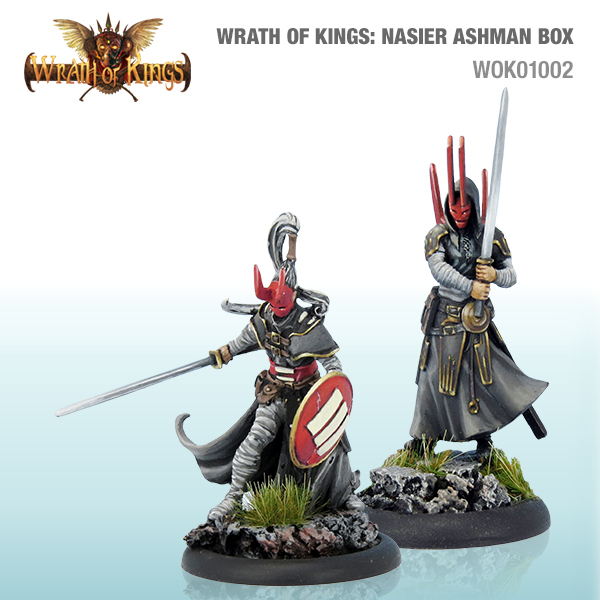 The Starter also comes with 12x Ashmen Swordsmen in three sculpts (4x of each) and an Ashmen Hakar. The Swordsmen are Rank 1 Infantry and the Hakar is a Rank 1 Leader. I really dig the masks with the big horns. Lastly, the box comes with 12x Pelegarth Bloodmasks and a Pelegarth Howl (the one with the horns). Again, the Bloodmasks are Rank 1 Infantry and the Howl is a Rank 1 Leader. All together, the Starter comes with 2x Rank 1 Leaders, 24x Rank 1 Infantry and 2x Rank 1 Specialists. The game itself recommends three sizes, with the largest being marked as the standard size. When building a list, 2x Rank 1's of a specific type can be swapped for a Rank 2 of the same type. So, you could swap 2x Rank 1 Infantry for a single Rank 2 Infantry. Same for Specialists and Leaders. As you can see, the Starter can do Patrol and only needs a single extra Rank 1 Leader to do Skirmish. You'd need a couple of boxes to upgrade to Battle. Picking up some Rank 2 models limits the actual number of models you'd need. By maxing out Rank 1 Infantry, the most models you'd ever need tops out at 45. Maxing out Rank 2 models gets you closer to 23 or so. Hopefully the Starter set will show up soon. I'm anxious to see the models.